A Sunday helicopter service between Cornwall and the Isles of Scilly will begin in November. The idea of the return flight between Penzance and Tresco is to encourage more weekend visitors in winter. The service has already caused controversy, with some residents in favour, but others saying it will spoil the tranquillity of the islands. The service was the idea of the manager of Tresco's Island Hotel and will run for a trial period of six weeks. Euan Rodger believes the islands are missing out on visitors because it is not possible to get back to the UK mainland on a Sunday. British International will operate the mid-afternoon Sunday trial flights. 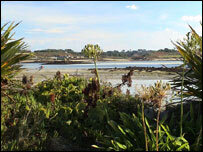 Writing on Scilly's internet site, some residents have claimed it will ruin their quiet Sundays. But others have said the islands need to support tourism and move with the times.